We hear all the time that fish is rich in proteins, and blue fish in fat, including the famous Omega… What we are not told is that that fat is just where pollutant, so common in our seas, accumulates, and that the fish being farmed can also have a lot of antibiotic and additives. Let us be conscious of what fish is really providing us. Let us eat fish, but without abusing. The more we eat, mainly of big carnivore (except hake and sole), the more toxins we are accumulating and the more we contribute to the over exploitation of sea. Let us eat less often those which are fattier and which accumulate more toxins (as salmon) and those of fish farm. Here we can see the ones of each type. We can profit all the vitamins and minerals from the little fish we eat in a bite. Fishing does not produce fish, but it takes it out from the environment; it would be the equivalent of hunting land animals, which almost disappeared nowadays. Although some people see the glass half full and others half empty, all the sectors related with fishing recognize that the situation of the seas is serious. At the present time, the worldwide fishing fleets have the capacity to fish more than the oceans can support. The state of exploitation varies a lot depending on the origin of the fish, but we can try to look for the less overexploited one. Let us eat more often herbivorous fish (those which do not eat other fish), because they are more abundant. Those which are easier to find are herring, sardine, anchovy, horse mackerel, squid, john dory, molluscs, whiting, forkbeards (or flatfish), sparrall, red mullet (or roger) and soup fish. Species with the most stable behaviour: sardine, squid and, if Mediterranean, mackerel and horse mackerel. Over exploited species are hake, codfish, tuna (here there is a study of the case in the Mediterranean), sole, and at the Mediterranean, red mullet. Do not choose the ones which look very young. Let us support those who are fighting for a better management of sea, Greenpeace, International Collective in Support of Fishworkers, World Wildlife Fund, Oceana. The majority of fishermen all over the world work at small or medium scale, in coastal areas; the 80% of the European fleet in the Mediterranean is of vessels having less than 12 metres length. The big fishing fleets are fishing in all oceans and cause big environment and social impacts. The artisanal fishing or at moderate scale is the most sustainable and profitable, and maintains alive the culture and the fishing villages (further information on the different types of fishing here). Let us look for your own fish. Let us buy at a reliable fish shop having fish market, looking for the freshest fish. It is compulsory that all fish selling points set a poster for each variety indicating where it comes from, among other details. The more we know the fish shop; the best we will know they are not cheating us. Species that most probably come from near fishery or aquacultures, sardine, anchovy, angler fish, bivalves molluscs, whiting, forkbeard, white forkbeard, sparrall, red mullet, soup fish. Species mostly fished in far away seas, hake, cod, tuna, sole, king prawn, squid…The frozen and processed fish is possibly from far away. The fish of traditional local fishing may be more expensive, but let us remember that it is not convenient to abuse from fish. It is better to eat fish fromthe traditional local fishing every now and then, than eating it often from industrial fishing. Let us ask to institutions to support traditional local fishing. Fish farming is growing. It is said by some people that it is the solution to the depletion of the sea, but… the food for this fish has to be fished also! And those exploitations have very important environment and social impacts; here we can see a sample. Let us eat little fish of aquaculture. 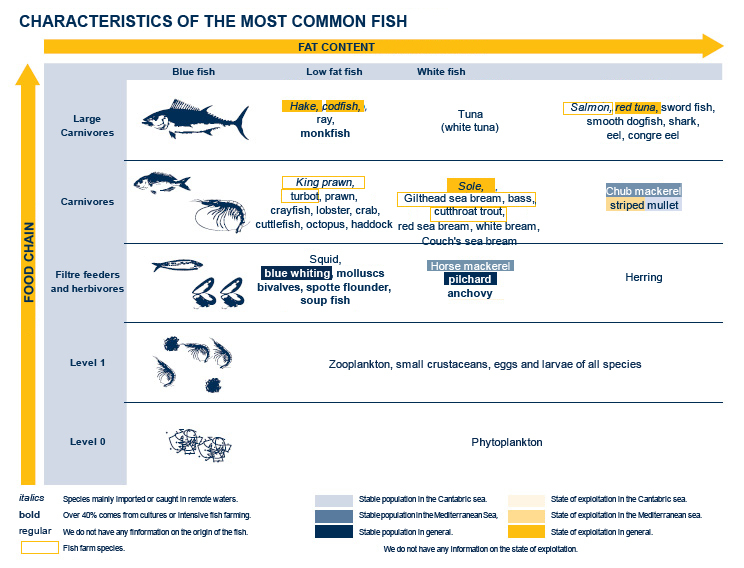 The species of fish most present in fish farms are salmon, prawns, turbot (a farmed variety of wild turbot), gilt-head bream, sea bass and trout. An unmistakable indicator to know if they have been farmed or they are wild ones, is the price: those bred in farms are surprisingly inexpensive. It is better not to eat fish that often, and eat wild ones when we do. Molluscs are also farmed: mussels, clams, cockles, oysters… This farming is more sustainable since molluscs are not fed by any other fish. Both at the fish shop and at the supermarket, there is fish of far away seas, frozen or not very fresh, and fished in the less sustainable way. There are also those ones of fishing farms. The big chains of supermarkets are part of a centralized economical model. As a difference, the best options for fish will be found only at fish shops and markets or through direct sale channels. Let us buy at a reliable fish shop having fish sold at the general fish market. Let us learn to recognize the freshest fish, which will by sure come from the coastal shore. Fishmongers can arrange well the fish and give advices to us. At the dock and at fish shops of some fishing locations it is possible to buy fish directly. There are fishermen and fisherman’s associations that sell by home delivery or at their own fish shops. Fish goes badly if it is not kept quickly and properly. Let us avoid it. On arriving from the fish shop, the first thing to be done is to keep the fish properly. To freeze it quickly, to defrost it slowly.